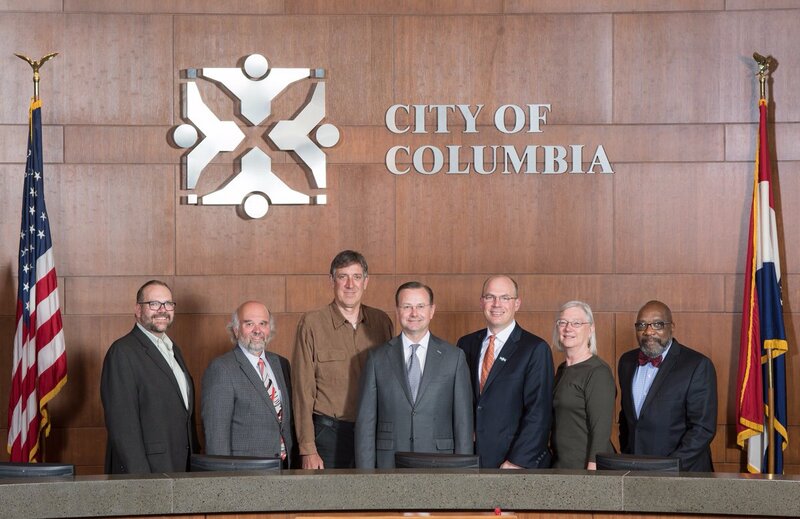 COLUMBIA, Mo 9/21/17 (Feature) -- Columbia residents won a historic victory Monday night, when the Columbia City Council (photo) rejected an electric utility rate hike, demanded financial accountability, and asserted long-overdue control over the public purse. It was the first time in 20 years this writer has seen the Council push back meaningfully on the city manager's annual budget, and for all the right reasons: inequitable rate structures; poor customer service; financial non-transparency; and a $300 million Swiss bank account that grows by millions every year. Council members raised almost every other rate -- water, trash, sewer, stormwater -- but their electric rate rejection stood out, for its outsized impact on household budgets; the reasons they rejected it; and the respectful way Council members acted. "Thank you for your innovation and willingness to find a solution." Mayor Brian Treece made these comments repeatedly, to the city staff members he also challenged (example at 1:35 in video here). Falsely sold as a "one percent" increase, the electric rate hike averaged a 2-8.5% increase for residents with a 0.5% hike for big business. Though clearly spelled out in the electric rate hike ordinance, other media never reported the averaging scheme. The inequitable rate hike wasn't the only thing city manager Mike Matthes hid. Though he and the city finance director present them in May and August of each year, March and June 2017 Interim Financial reports for city departments have yet to materialize. The missing financials posed grave concerns for Mayor Treece, who emphasized that without them, Council members were making decisions in the dark. The water rate hike passed by a 5-2 vote, Fourth Ward Councilman Ian Thomas and Treece opposed; the electric rate hike failed 6-1, with Second Ward Councilman Mike Trapp the lone yes vote. The water and electric rate hike discussion begins at roughly 1:50 and 2:24, respectively, in the video here. "Rate inequities" troubled Thomas. His own careful study of the two rate types -- base and volume charges -- revealed that present utility customers subsidize future utility customers and low-volume users subsidize high-volume users, he said. "Huge problems in the front office," especially with billing, troubled Third Ward Councilman Karl Skala, who like Treece said he's heard from many constituents about erroneous utility bills. "Water and light bills are usually how you deal with the public, so I'm having a political problem here," Skala said. Sixth Ward Councilwoman Betsy Peters broached the missing financial reports around 1:58 in the video. Matthes said his staff had the missing information. "It's great your staff has this information, but...Council doesn't have it," Peters said. The city manager responded with one of his famous whoppers at 2:00:40. "With all due respect, you would normally not have this by now," he said. "We're behind this year, but you wouldn't have this in a normal budget year, either." But Interim financial reports are out in May and August. This year on the city's financial reports page under "Other Reports" they are mysteriously absent. Kicking off the electric rate hike discussion, "all these rate hikes were sprung on us four weeks ago" without up-to-date financial reports, Treece said. "These are serious issues." Though he voted for the water rate increase, "I'm just not comfortable with a lot of the numbers I've seen on the electric side," Fifth Ward Councilman Matt Pitzer noted. "Wild swings" in staff projections vs. reality bothered him. The electric utility's reserve fund is up almost $7 million more than projected, he said. Matthes tried a punishment ploy, suggesting he would cut or postpone important electric utility projects if the rate hike failed. Acting as though his suggested cuts and postponements were a done deal, he got a shock: Council members weren't buying it. "I'm not entirely convinced any of these cuts will be necessary, based on how inaccurate some of the other projections have been," Pitzer said. "That's where I am too," Treece agreed. "I can't say for sure we need to cut anything." "I don't want to cut anything either," Thomas agreed. "The electric utility does have $31 million in reserves," Matthes conceded. "If we spend that [in lieu of cuts] that would take it down to $29 million." In the budget hearing's most telling comment, "I would say we either spend down the $31 million in reserves, or we wait until the Sutter money gets booked, or we get an accurate financial report to know if we need to reduce any of these expenses," Treece concluded, establishing Council -- and voter -- authority. The Water and Light Utility will receive $1.5 million from the sale of land known as the Sutter site to Aurora Organic Dairy. Revelations about City Hall's nearly $300 million Swiss bank account, which holds money left over after each year from each city department, have loomed large. It came up at the Council budget retreat in June, when Matthes and finance director Michele Nix spent 30 minutes trying to explain it. Beside this publication, the Columbia Daily Tribune has addressed the topic twice: in an op-ed and a story about the rate hikes. "Cash reserves flow into the city’s pooled cash account, which has been the subject of skepticism with claims that the city holds a Swiss bank account," the Trib reported. "Held at Union Bank of Switzerland, or UBS, the pooled cash account totaled nearly $295 million." Voters, ratepayers, and taxpayers have a hard time with a city government raising rates, fees, fine, and taxes every year while stockpiling cash in low interest accounts that have nothing to do with the public good. Expect Council members ask more questions -- and demand more accountability for the money City Hall demands from us.